Miso soup is the ultimate comfort food. It is gentle, soothing and has a delicious savoury flavour. It is the ideal thing to eat if you have an upset, sensitive gut because it does not contain anything that is likely to upset you. The stock used in Miso soup is called ‘dashi’ which does not use onion or garlic yet tastes delicious. Dash’s flavour is referred to as ‘umami’ in Japanese. This flavour is based on the flavour of the amino acid -glutamic acid and naturally occurring inosinates. Dashi is made by soaking the dried, strap leafed seaweed, kombu (known in the UK as kelp). After the kombu has been soaked it is removed from the water and leaves a slightly salty, clear liquid behind. Dried and smoked bonito flakes (katsuobushi) are then added to the stock to add more flavour. Finally miso paste is stirred into the liquid to complete the stock. Bonito is another name for skipjack tuna. Some people like to add just a few drops of mirin which is a sweet Japanese rice wine. This does taste nice as it rounds off the flavours but it is not essential. This forms the basis of the soup and then other ingredients are added such as steamed spinach and tofu. 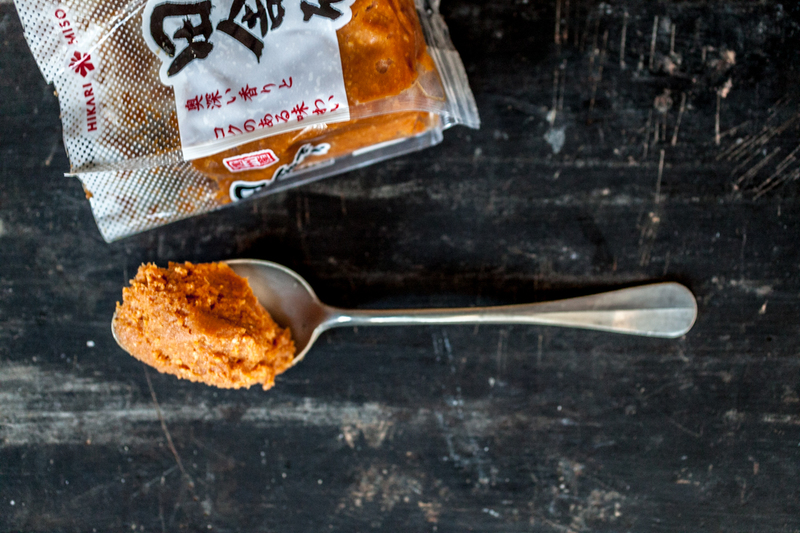 Miso paste is made from fermented soya beans and is low in fermentable carbohydrates. The carbohydrates in the the soya are drastically reduced by fermentation. Different regions of Japan prefer different types of miso paste. In Kyoto they prefer the white slightly sweeter version of miso. Other regions prefer the dark version. I have used the medium version which neither too sweet nor too strong. All three types of miso paste can be obtained from the Japan Centre and are not too expensive. Once opened miso needs to be kept in the fridge. 75g firm tofu (silken is Ok if that is all you can get), cut into small cubes 0.5 – 1 cm along one side. Begin by preparing the dashi. Place the kombu in a large pan or wok and pour over hot, but not boiling, water. Leave to soak of at least an hour. Remove the kombu and add the dried bonito flakes (katsuobushi) and bring the liquid to the boil and then turn off the heat. Leave the bonito flakes to soak for 2 or 3 minutes. Add the miso to the dashi stock by half submerging a tea strainer or small, fine mesh sieve in the stock. This is to filter out the larger particles in the miso paste. The idea is to have a smooth soup with little clouds of miso paste floating around the bowl. It should not be lumpy. Add the steamed spinach and toful cubes and serve scattered with chopped chives or other green leaves. I use blood veined sorrel. In Japan miso soup is eaten with nearly every meal it is very much part of their staple diet. You could eat a bowl of rice with it to make it more substantial. 19 Jun	This entry was written by Joan Ransley and published on June 19, 2015 at 12:19 pm. It’s filed under Uncategorized and tagged dietetics, IBS, IBS Network, low FODMAP diet, LowFodMap, miso, Miso soup, soup. Bookmark the permalink. Follow any comments here with the RSS feed for this post. I like to use miso paste as an alternative to broth. I add it to soups, risotto, and other dishes and it gives a nice flavor.